"And the children of citizens of the United States that may be born beyond sea, or outside the limits of the United States, shall be considered as natural born citizens." "The first section of the second article of the Constitution uses the language, 'a natural-born citizen.' 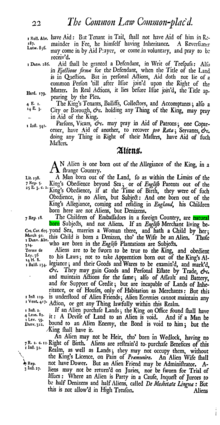 It thus assumes that citizenship may be acquired by birth. Undoubtedly, this language of the Constitution was used in reference to that principle of public law, well understood in this country at the time of the adoption of the Constitution, which referred citizenship to the place of birth." Additions might always be made to the citizenship of the United States in two ways: first, by birth, and second, by naturalization. This is apparent from the Constitution itself, for it providesFN6 that ‘no person except a natural-born citizen, or a citizen of the United States at the time of the adoption of the Constitution, shall be eligible to the office of President,'FN7 and that Congress shall have power ‘to establish a uniform rule of naturalization.’ Thus new citizens may be born or they may be created by naturalization. This passage suggests that the opposition is between (1) citizens by birth (natural born) and (2) citizens by naturalization (not natural born). So far as I can tell, only two other major presidential candidates since the founding era (when no one was born in the United States since it didn't exist) have been born of American parentage on foreign shores--Barry Goldwater & George Romney. These examples are contemporary, and the constitutional issue never crystallized in either case. Romney lost the Republican nomination to Nixon, and Goldwater lost the election to Johnson. So what is the original public meaning of the phrase "natural born citizen"? We might begin by ruling out an anachronistic and implausbile reading that might distinguish "natural birth" from C-sections or perhaps in-vitro fertilization. It seems obvious that the semantic content of the clause should be derived from usages that were contemporaneous with the framing and ratification of the Constitution of 1789. Nor does it seem reasonable to interpret the phrase "natural born citizen" as the concatenation of the meaning of the individual words "natural," "born," and "citizen." The concatenated meaning might make every human whose birth was not supernatural ("virgin birth?") a natural born citizen, but this meaning bears no relation to the context. 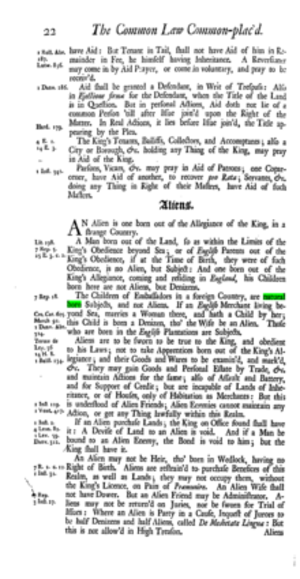 Rather, it seems likely that the public of 1789 would have recognized that the unit that bears meaning in the context of the clause is the triplet "natural born citizen." Was this phrase in "general circulation," such that competent speakers of American English of the late 18th century would have recognized some meaning or set of alternative meanings as the "conventional semantic meaning" or equivalently "public meaning" of the phrase. It's hard to say without doing more research. The alternative possibility is ordinary speakers would have considered the possibility that "natural born citizen" was a technical legal phrase, and deferred, given the division of linguistic labor, to specialist usage. In this case, it would likely have been a legal usage. I read with some amusement the struggles that some non-lawyers [and some lawyers as well] have been having understanding the language of Art II, Sec. 1 of the U.S. Constitution: "No Person except a natural born Citizen, or a Citizen of the United States, at the time of the Adoption of this Constitution, shall be eligible to the Office of President . . . ." If the drafters of the Constitution had wanted to require that presidents be born in the United States, they could have done so. Instead, they invoked the then-standard idea of natural citizenship as reflecting natural allegiance to the king or the state. The is more to Lindgren's post, but this gives you the flavor! Lindgren argues that the original public meaning of the phrase "natural born citizen" was not ambiguous, and that it supports the "citizen by birth" interpretation. Dorf's framing of the semantic question is imprecise. He seems to be arguing that the phrase "natural born citizen" is ambiguous, having the two senses identified above: (1) citizen by virtue of birth on American soil, or (2) citizen by birth to American parents. I am not convinced that the evidence really supports the ambiguity that Dorf seems to claim is present. The key question (for an original public meaning originalist) is whether contemporary specialist usage of the phrase supported the "American soil" interpretation. On this issue, Lindgren has compelling evidence, and most of the contrary evidence comes from context where the possibility of birth abroad of American parents was not an issue. But that isn't the point of this post. Rather, I want to consider the possibility that Dorf is right & that the phrase is ambiguous--in the technical sense that it possesses two or more meanings. Public Meaning Originalism and the Problem of "Original Ambiguity"
What resources do originalists have when ambiguous language is used in the Constitution. One possibility is that the context of constitutional utterance resolves the ambiguity. That is, some ambiguous words and phrases can be disambiguated by context. But in some cases, context may not resolve te ambiguity. Let us suppose then, perhaps counterfactually, that the original public meaning of the phrase "natural born citizen" would have been understood as ambiguous by either ordinary citizens or (if it is a "phrase of art," then by the relevant specialists, persons learned in the law). That is they would have said, "The meaning of this provision is ambiguous, even taking context into account. It could mean "born on American soil" or it could mean "born of American parents." It is at this point that "new originalists," for example Keith Whittington and Randy Barnett suggest that "interpretation runs out," and a different modality of constitutional practice must be engaged--this is what Whittington calls "constitutional construction," where construction is the modality of constitutional practice that resolves irreducible constitutional vagueness or ambiguity. Once we have arrived at this stage, the resources of "original public meaning originalism" have been exchaused--by definition. Interpretation tells us that the meaning (semantic content) of the provision was vague or ambiguous. So a construction is required in order to resolve the ambiguity or draw the line that will permit the application of the vague provision. Of course, originalism is a family of theories and not a single view. Although many "new originalists" agree on "original public meaning" as the correct account of constitutional interpretation, there is wider divergence on what is the best theory of constitutional construction. Randy Barnett's distinctive theory of constitutional legitimacy sanctions as justice-enhancing account of constitutional construction. Keith Whittington has emphasized deference to democratic political processes. Jack Balkin suggests that construction should be guided by reference to the purpose of the constitutional provision at hand. But all of these are theories of constitutional construction held by theorists who are recognized as "new originalists." Dorf's own analysis actually seems to be originalist as well. Of course, Dorf is free to label his own views--he is entitled to claim that he is "not burdened by the label of 'originalist,'" but it also fair to ask whether the substance of his views is consistent with originalist theory. Of course, that's not easy to discern from a single blog post, but so far as I can tell, Dorf's methodology is entirely consistent with the "new originalism," that is, with the view that the semantic content of the Constitution is fixed by its original public meaning. Dorf seems to believe that his move to values is sanctioned by what we might call "original ambiguity." If there were clear evidence of the original public meaning of "natural born citizen," then it seems the Dorf's understanding of "plausibility" would require that he accept that meaning. But because Dorf believes, pace Lindgren, that when the original public meaning is exhausted there remains residual ambiguity, he believes he is warranted to resorting to a justice-enhancing principle of construction. Dorf's method of constitutional construction is a variation of Barnett's theory of constitutional construction, but with Dorf's views about justice substituted for Barnett's. It is the purpose of this article to make the positive case for an under-appreciated conception of rights: specified rights. In contrast to rights conceived generally, a specified right can stand against different behaviour in different circumstances, so that what conflicts with a right in one context may not conflict with it in another. The specified conception of rights thus combines into a single inquiry the two questions that must be answered in invoking the general conception of rights, identifying the content of a right in light of what is justifiable to do under the circumstances. I present the case for specificationism in four sections, focusing on property rights. First, I argue that rights are based upon more fundamental reasons, and that this instrumentalism is compatible only with specificationism?a fact necessity cases illuminate. Next, I explain how specificationism embodies a fully moralized understanding of rights, and point to a dilemma that one faces in denying this. Third, I argue that the gap in property rights exposed in necessity cases entails that there is no right-based duty to compensate in such cases. Finally, I offer an error theory to explain the (false) attraction of the general conception of property rights. I always read Oberdiek. Highly recommended. Price gouging occurs when, in the wake of an emergency, sellers of a certain necessary goods sharply raise their prices beyond the level needed to cover increased costs. Most people think that price gouging is immoral, and most states have laws rendering the practice a civil or criminal offense. The purpose of this paper is to explore some of the philosophic issues surrounding price gouging, and to argue that the common moral condemnation of it is largely mistaken. I make this argument in three steps, by rebutting three widely held beliefs about the ethics of price gouging: 1) that laws prohibiting price gouging are morally justified, 2) that price gouging is morally impermissible behavior, even if it ought not be illegal, and 3) that price gouging reflects poorly on the moral character of those who engage in it, even if the act itself is not morally impermissible. It is, however, a bit of a puzzle why one might think that engaging in a morally permissible activity would constitute evidence of an immoral character. If an action is morally permissible, then what can one’s performing that action say about one’s character other than that one is disposed to perform morally permissible actions? Still, many find arguments of this sort convincing. Immanuel Kant, for instance, thought that non-human animals did not have moral status, and hence that there was nothing wrong per se with treating them as mere means to one’s own ends. Still, even Kant thought there was something wrong with people who inflict gratuitous suffering on animals. What was wrong with them, however, was not merely that they were causing animals to suffer, but that in doing so they betrayed a defect in their character. The kind of people who inflict gratuitous suffering on animals, Kant reasoned, tend to also be the kind of people who inflict gratuitous suffering on human beings. Hence, even though there’s nothing morally wrong with causing animals to suffer in itself, people who do so thereby demonstrate that they are likely to do other things which are morally wrong – viz., causing human beings to suffer. Kant’s reasoning points us in the direction of one way in which engaging in morally permissible behavior might betray a morally vicious character. We should notice, though, that Kant’s reasoning is only valid on the assumption that moral character operates in a fairly ‘coarsegrained’ way. After all, it certainly seems as though there is a fairly sharp and obvious distinction to be made between hurting animals and hurting human beings, such that even if one had a disposition to engage in the former sort of activity, one might lack the disposition to engage in activity of the latter sort. If, however, our dispositions are so coarse-grained that they cannot track the relatively fine-grained distinctions between different the different targets on which cruelty might be inflicted, then it is possible that there will be what Nozick calls an “undesirable moral spillover” between actions of one sort and actions of another.l On this scenario, our options are less like a “disposition to hurt animals” versus a “disposition to hurt human beings,” and more like a “disposition to hurt living things” or not. One who hurts animals is expressing a disposition of this latter coarse-grained sort, and this, on the Kantian account, makes him liable to do some things which are morally permissible (hurting non-human animals) but also to do some things which are morally impermissible (hurting human beings). As it so happens, Kant was mostly correct when it comes to people who inflict needless suffering on animals.li But notice that his argument rests inescapably on empirical premises. Whether our dispositions are fine- or coarse-grained is a question for empirical psychologists to resolve, not one which can be settled from the philosopher’s armchair. And there’s no reason to suppose that the answers psychologists return will be of a tidy or uniform sort. Human beings might be very poor at drawing distinctions between different instances of inflicting pain, but very good at drawing distinctions between, say, different ways of expressing falsehoods (most people, I would suppose, are unlike Kant in recognizing a rather stark moral difference between lying to one’s boss about one’s educational experience and lying to a murderer at one’s doorstep about the location of his intended victim). It is similarly an empirical question, then, whether the motivations which drive people to engage in price gouging are sufficiently coarse-grained that they will, as a tendency or as an inexorable psychology law, drive them to engage in morally impermissible acts as well. A disposition to charge market-clearing prices for necessary items to desperate people might also be a disposition to engage in acts of fraud or coercion against the vulnerable when one can make a profit by doing so. But then again, it might not. I should have thought that the more obvious aretaic critique of most price gouging would not be based on a vice that is connected with a disposition to do the impermissible--most plausibly connected with the virtue of justice & perhaps pleonexia. Rather, the salient vices (in a neo-Aristotelian virtue ethics) might be beneficience and liberality--mediated, of course, by phronesis or practical wisdom. To the extent that justice comes into play, the full account must include equity--which in this context would correct strict legal justice with what Terry Irwin translates as "fairmindedness." Wouldn't the phronimos, fully equipped with the moral virtues including justice (incorporating equity), liberality, and beneficience, be disposed to charge less than the market will bear? Of course, attention to practical wisdom suggests that this disposition will be situation dependent. A local shopkeeper who knows her customers (and hence who would be capable of non-price based rationing) might be in a better position to charge "reasonable prices" than a regional big-box store that might cause harm by using queuing, which could turn out to be a harmful and inefficent method of distributing a scarce resource such as food or fuel. Zwolinski might return to permissibility as the master moral concept in this context, but surely that would beg the big question--whether virtue ethics offers a more supple account of the morality of "gouging." It is traditionally assumed that the role of ascertaining and evaluating the social facts underlying a statute belongs to the legislatures. The courts, in turn, are tasked with deciding the law and must defer to legislative factfinding on relevant issues of social fact. This simplistic formula, however, does not accurately describe the courts' confused approach to legislative factfinding. Although the courts often speak in terms of deference, they follow no consistent or predictable pattern in deciding whether or not to defer in a given case. Moreover, blanket judicial deference to legislative factfinding would not be a wise general rule. Because social factfinding plays a decisive role in constitutional analysis, blind judicial deference would undermine the courts' responsibility to protect individual rights. Judicial treatment of legislative factfinding is thus sorely in need of a coherent theory. This Article proposes a new approach, a paradigm of selective independent judicial review of social facts. Under this model, the courts should independently review the factual foundation of all legislation that curtails individual rights, even when those rights do not receive strict or heightened scrutiny. This approach is unique in ensuring a baseline protection for all individual rights, including emerging rights, while respecting the division of power between the branches of government. The paradigm is needed because, this Article asserts, legislatures are poorly positioned to gather and assess facts dispassionately, especially when addressing laws that restrict controversial or minority rights. The process of factfinding in federal trial courts ensures a superior factual record when such rights are at stake. This Article illustrates the courts' and legislatures' contrasting capacities for factfinding through case studies, including "partial-birth abortion," gay parenting, and indecency on the Internet. Moreover, the Article argues, because of the courts' vital role in protecting individual rights, the proposed paradigm honors constitutional structural principles. Proponents of broad deference to legislative factfinding often point to the Lochner era to show the dangers of independent judicial review of social facts.14 But independent judicial review need not be an all-ornothing deal. My proposal takes into account the federal courts’ important responsibility to protect unpopular and minority rights, while respecting the division of power between the legislatures and the courts. In particular, my approach would allow courts to defer to legislative factfinding when legislatures seek to protect or expand individual rights.15 Moreover, because I propose independent judicial review in all cases of asserted individual rights, including rights subject to rational basis review, my paradigm accounts for emerging rights, such as the rights of lesbian and gay adoptive parents. Part II turns to the normative question: Are new laws needed? It concludes that legislatures should not enact new criminal laws to account for the new social harms that may occur in virtual worlds. Virtual worlds at bottom are computer games, and games are artificial structures better regulated by game administrators than federal or state governments. The best punishment for a violation of a game comes from the game itself. Criminal law is a blunt instrument that should be used only as a last resort. The state's power to deny individuals their freedom is an extraordinary power, and it should be reserved for harms that other mechanisms cannot remedy. I'm a big fan of Kerr's work & this is a very interesting paper. Highly recommended. Many scholars question whether competition between experts in legal, political, and economic contexts elicits truthful information and enables citizens to make informed decisions. And, nowhere is this question more heatedly debated than in research on our adversarial legal system. In this paper, we analyze experimentally the conditions under which competition between experts induces the experts to make truthful statements and enables citizens to improve their decisions. Our results demonstrate that, contrary to our theoretical predictions and to critics of our adversarial legal system, competition induces enough truth-telling to allow subjects to achieve modest improvements in their decisions. Then, when we impose even weak institutions (such as small penalties for lying or slim chances of verification) upon the competing experts, we observe dramatic improvements in both the experts' propensity to tell the truth and in subjects' decisions. We find similar improvements when the competing experts are permitted to exchange reasons for why their statements may be correct. In this paper, I discuss the tension between virtual worlds and user-generated content. I begin this essay in Part I with some efforts at definition, given that both user-generated content and virtual worlds are terms of recent origin. In Part II, I will explore some of the issues raised when user-generated content is made a central part of a virtual world, focusing on the difference between Second Life and World of Warcraft. Finally, Part III, I will consider what the presence or absence of user-generated content in virtual worlds might mean for the future of our increasingly virtual and interactive digital culture. Justice Kennedy's significant nexus test may emerge as the proverbial silver lining of the U.S. Supreme Court's June 2006 decision in Rapanos v. United States, at least so far as recognition of ecosystem services is concerned. The Court's opinion in Rapanos was fractured. Nevertheless, it left no doubts that the Clean Water Act's jurisdiction over navigable waters had been limited, drawing criticism for both its lack of clarity and its restriction of federal jurisdiction under the Act. The extent of that restriction, however, would depend on which of the three major opinion's in the case - Justice Scalia's plurality, Justice Kennedy's concurrence, or Justice Stevens' dissent - the lower courts chose to follow. Since the Rapanos decision, it has become clear that Justice Kennedy's concurrence provides the controlling test or one of the controlling tests in every circuit where the Court of Appeals has addressed the issue. As such, Justice Kennedy's significant nexus test is likely to guide Clean Water Act jurisdiction for the foreseeable future, unless Congress decides to act instead. While immigration federalism has received considerable scholarly treatment, comparatively little attention has been paid to particular local immigration enforcement practices. This Article discusses one practice already in wide use: civil immigration violation arrests by police based on records in the federal NCIC database. It raises several objections to the practice: its ambiguous legality; its tendency to encourage racial profiling of Latinos; and its erosion of the trust of Latino communities in law enforcement. It concludes by proposing an administrative regime to coordinate and monitor state and local efforts to enforce immigration law, and control the dissemination of immigration records.